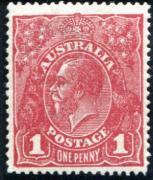 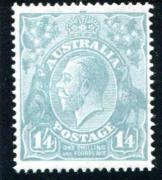 These stamps are also very popular postage stamps of Australia. 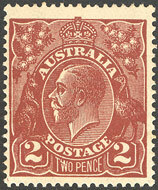 The basic design consists of the effigy of the protrait of King George the 5th, flanked by the two of the most prominent representations of the country's coat of arms: the kangaroo (left) and the emu (right). 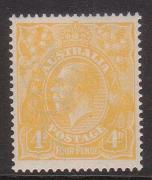 These postage stamps were printed on watermarked paper that has 5 distinct varieties : single watermark, large multiple watermark, small multiple watermark and C of A watermark. 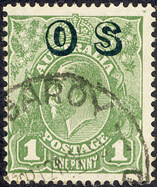 Some also appear on paper with no watermark.